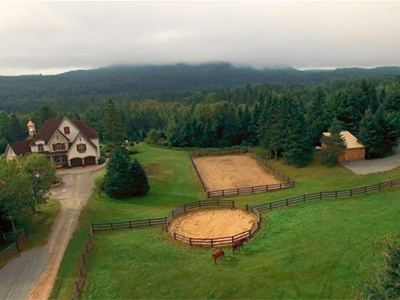 What You Get: A stunning home and stables on 100 private acres. The House: The 4,571 sq. ft. home is absolutely stunning, with countless upgrades and high end finishings throughout. There are 5 bedrooms, 3 bathrooms and plenty of space for entertaining and relaxing with a music room, home theatre, wine cellar, heated inground salt water pool, tennis court and more. The Barn: The well-appointed barn has large box stalls and a wash/grooming area. There is a large outdoor sand ring, round pen and several turn out areas. There is also access to miles of trails nearby.